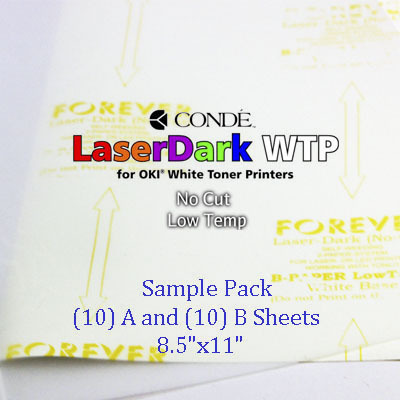 Condé LaserDark WTP allows you to print graphic designs in any color, including white, and transfer that design without any excess emulsion, cutting or trimming of your transfer. 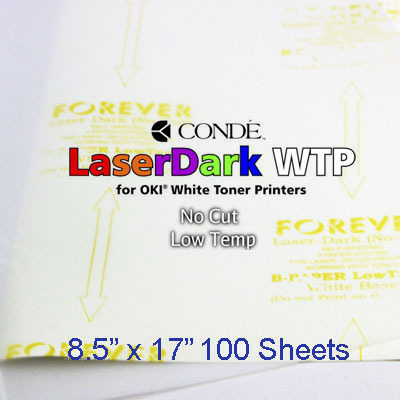 Unlike traditional 4-color process laser printers, the Oki White Toner Printers and LaserDark WTP will capture gradient and halftone designs with ease and give you an increased color gamut for more detailed artwork, including photographic reproductions. 12.5" x 19" Forever Low Temp Laser-Dark 2-Step Transfer Paper - Self-Weeding 2-Paper-System for black, dark colored and light colored garments with the 920WT White Toner Printers (OKI 920WT). 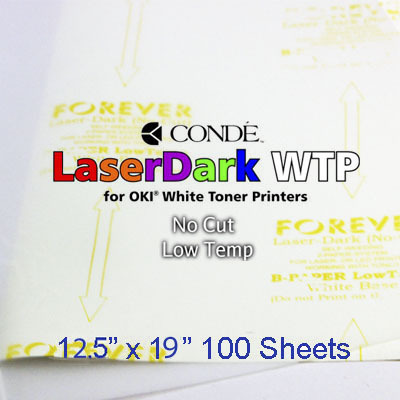 Compatible with OKI pro920WT Printer Only.